Kayla McKenney, Amanda Sproul, Tristin Bean and Mary Barker earn certificates. 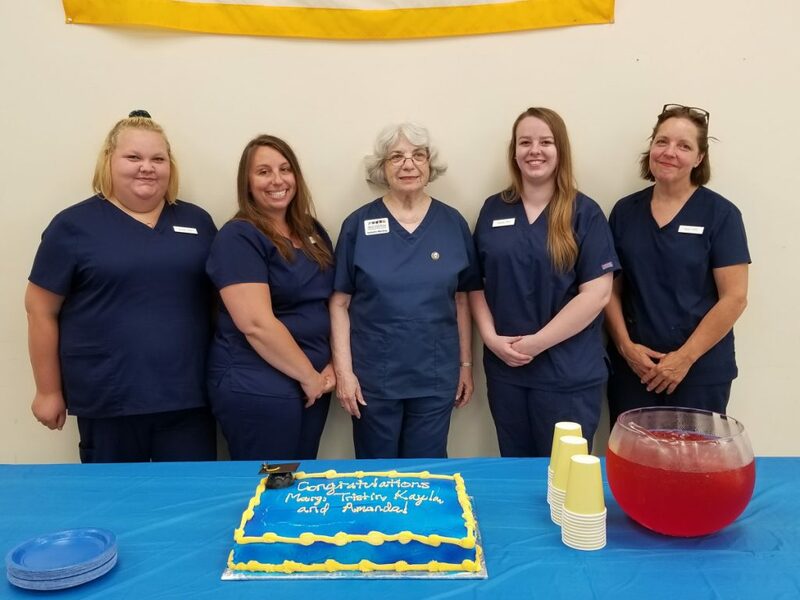 Augusta Adult & Community Education recently announced that all members of its spring 2018 Certified Nursing Assistant course passed the State of Maine CNA certificate exam. The four area students graduated July 17, after completing the State of Maine prescribed CNA curriculum. The 200 hours of study included nursing theory, personal care skills and 90 hours of clinical experience. Students completing the 12-week course included: Mary Barker, of Belfast; Tristin Bean, of Augusta; Kayla McKenney, of Vassalboro and Amanda Sproul, of Pittston. The Tuesday evening graduation ceremony was held in Augusta’s Capital Area Tech Center. Zane Clement, director of Augusta Adult & Community Education welcomed guests and moderated the celebration. Isabelle Markley, RN and clinical instructor, with the assistance of Helen Emery, presented CNA pins and flowers to each student. CNA graduate Mary Barker received the highest grade award and also gave the student address to the audience. Applications are being accepted for the fall CNA course. For more information, call 626-2470 or stop by Augusta Adult & Community Education. 33 Union St., Suite 2, in Augusta.